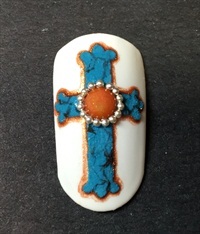 Ryoko Garcia of Bella Day Spa and Salon in Navarre, Fla., shows how to make this turquoise cross nail art design. Ryoko Garcia (@nailsbyryoko) of Bella Day Spa and Salon in Navarre, Fla., shows how to make this turquoise cross nail art design. 1. Apply two coats of white gel-polish and cure each coat. 2. Sculpt a cross out of colored acrylic. 3. Draw black lines to create turquoise texture using acrylic paint. 4. Apply orange mixture to the center. 5. Outline the cross and add more details. 6. Apply gel top coat and cleanse, then apply matte top coat on the cross only.